A pioneer in Islamic microfinance, Al-Amal Microfinance Bank (Al-Amal) was established in October 2008 as the first microfinance bank in Yemen. Dedicated to providing poor micro-entrepreneurs with access to financial services, Al-Amal targets youth and women with microcredit, savings, and insurance, among other services. To date, Al-Amal has developed two youth-friendly products, Youth Fund (credit) and Child Savers (savings). Through slight adaptations to its product offerings, including collateral requirements and minimum balances, Al-Amal has quickly grown its reach to thousands of Yemeni youth. By the end of 2010, Al-Amal had disbursed 6,317 loans to young entrepreneurs between the ages of 18 and 30 and had opened 8,833 savings accounts for children under the age of 18. 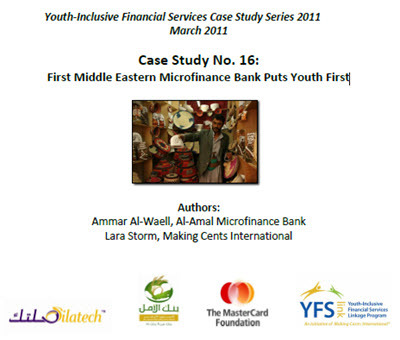 In this case study, Al-Amal discusses techniques for providing young people with appropriate financial services, including staff training and youth-friendly marketing and delivery channels.